Currently pursuing her Bachelors of Science degree in Biology at The University of the West Indies (Trinidad and Tobago). 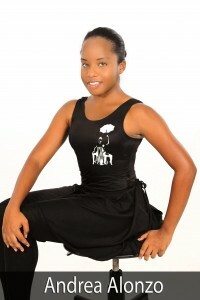 She has been dancing at The Candice Clarke Academy of dance since the year 2007. Her first dance performance was an African piece at a Christmas concert held by her primary school Sacred Heart Girls R.C School, where she achieved awards of merit for academic excellence. She was not only on top of her school work at such a young age, but engaged herself in extra- curricular activities such as karate, swimming, netball and Girl Guides. Her undiscovered love for dance surfaced when she performed for the second time, at her church, Montrose Wesleyan Holiness. This passion for dance encouraged her to take the art to the next level, and so, she joined The Candice Clarke Academy of Dance. At Level 3, her journey of dance began, where she was exposed to a variety of dance genres; ballet, modern, jazz, African and Indian folk, through training as well as the various guest performances and productions she was a part of. Her first performance with the academy was at a book launch held at the Centre of Excellence. Each dance performance was a new experience and challenge for Andrea, who learnt that dance is not only an art style of the body, but a medium of expression. In the year 2009, she performed her first solo at one of the academy’s productions entitled “Story of the Dancer 2- Exhale”. She was given the privilege of experiencing dance at both a regional and international level, when the academy toured to Jamaica in 2011 and New York in 2012. Andrea, along with the academy, participated in workshops with the National Dance Theatre Company of Jamaica as well as the Alvin Ailey Dance Company in New York. Prior to these tours, her local performances included: The 5th Summit of the America’s Opening Ceremony (2009), The Commonwealth Heads of Government Opening Ceremony (2009), Story of the Dancer part 1(2008), Story of the Dancer 2- Exhale(2009), Opening of the Soca Awards(2010), and Golden Jubillee (2012). Apart from dance, Andrea served her community through the Rotaract Club of Arima West, where she held the position of treasurer on the board, at Bishop Anstey and Trinity College East Sixth Form. At her secondary school, she was awarded for academic achievements and was congratulated on her excellent performance in the CXC examinations. The academy’s motto “Dance with a cause” insinuates the main purpose of the academy, which is to use dance to address serious matters faced by those in society and simply to spread joy. Andrea recently visited the Cyril Ross Nursery and Princess Elizabeth Home where she was a dance light for the shows the academy displayed, and also partook in charity shows at the Bustamante Children’s Hospital in Jamaica and Children’s Aid Society in Harlem, New York.